This document will describe the steps to form a model with which to control a motor via a potentiometer and read the values with HANtune. For this workshop we will be using an Olimexino as microcontroller board. 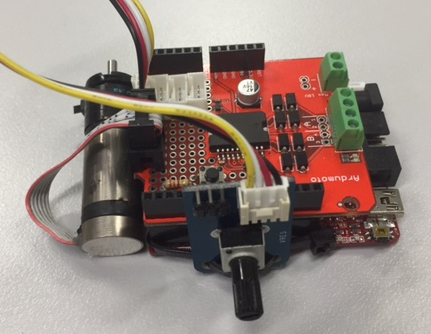 On top of the Olimexino is a shield with a motor driver or H-bridge, the Ardumoto. The H-bridge is controlled with a PWM signal for the speed on pin D3 and a digital output for controlling the direction on pin D12. A small DC motor which has an encoder connected to the shaft on one side and a gearbox on the other side is connected to the H-bridge. The encoder is connected to pins D6 and D7 and gives around 14000 pulses per rotation. Next to that there is a potentiometer attached to the Olimexino on pin A3. The potentiometer will serve as a setpoint for the motor speed. The further the potentiometer is turned the faster the motor should turn. Before being able to start with this process it is necessary to install certain programs such as MATLAB. These steps are described in ‘Getting Started Guide Olimexino.docx’. It is advised to use MATLAB 2012a or later for this workshop.